Waste away your mind too. Independent filmmaker Jeremy Seifert chose a very apt title for the anti-GMO documentary he wrote and directed in 2013. The title, GMO OMG, is an expression of incredulity, shock, and confusion about the subject he treats. These are qualities that Seifert has found very useful in constructing his narrative. He plays upon peoples’ misconceptions and fears about genetically modified organisms in food manufacturing. In the end he manages to convince himself of these misconceptions and fears. There is some nice production quality in GMO OMG. It is beautifully shot and aesthetically pleasing to watch. It is a family-oriented flick with a homely and earthy feel. In this sense, it differs from the conspiracy-happy fringe fare of previous anti-GMO documentaries such as Gary Null’s Seeds of Death. Its slick and aesthetic packaging makes it accessible to a much more mainstream audience of well-intentioned but uninformed people who will find its tone more appealing than the jackbooted nuttiness of other anti-GMO films and videos. But intellectually, GMO OMG leaves much to be desired, and its mainstream façade makes it more worthy of refutation and correction. We tried to be awake and make good decisions, to look out for our children and do our best for them. But one thing we totally missed – we just never heard about it – was GMOs, genetically modified organisms. Seeds, much like my son Finn’s seeds but with altered genes. And they are in our food, for either good or ill I didn’t know. But it bothered me that we were eating them and didn’t even know what they were. I decided to see if anyone else knew about GMOs. And that was the beginning of a very long journey. I suddenly felt uneasy about all the food we were eating. So I did some research to answer a very basic question: what is a GMO? According to the World Health Organization, GMOs are “Organisms in which the genetic material has been altered in a way that does not occur naturally.” But what does that mean exactly? It gets complicated pretty quickly. 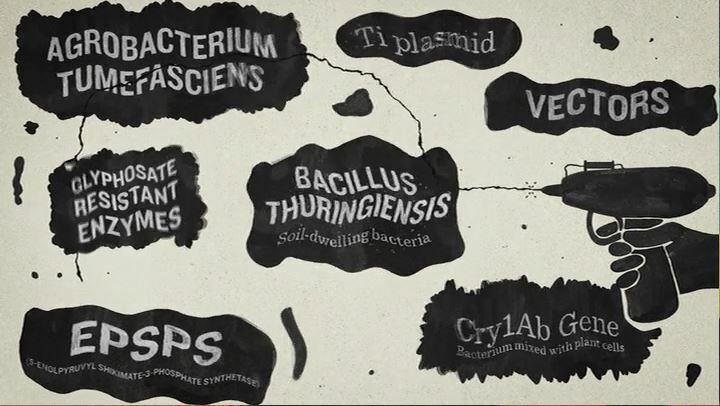 They involve Agrobacterium tumefaciens and vectors and Ti plasmids and Cry1Ab genes taken from a soil-dwelling bacteria [sic] called Bacillus thuringiensis. There are glyphosate-resistant enzymes called EPSPS, and my favorite, a gene gun with protoplast electroporation bombarding cells with gold particles coded with DNA encoding. Seifert double- and triple-tracks his voice in the background audio during this narration to turn it into a cacophony designed to make the information he is throwing at the viewer seem more confusing and complicated than it really is. He never goes on to explain any of the things he includes in his list of complicated things. This is not good science communication. It’s just an attempt to intimidate his viewers with scary-sounding and obscure-sounding technical terms. Jeremy Seifert trying to intimidate his viewers with words he thinks sound scary. I couldn’t find anything definitive on the health effects of GMOs. Most studies were only three months in length, done by the same companies selling the GMOs. The studies aren’t peer-reviewed and they refuse to release the raw data to the public. Were they hiding something? Seifert got all of that wrong. There are over 2000 scientific studies on the health effects of GMOs. These studies are all peer-reviewed, and to claim otherwise as Seifert does is patently absurd. This embarrassment of riches has resulted in an overwhelming scientific consensus that GM foods are at least just as safe for human consumption as any non-GMO food. The American Association for the Advancement of Science concluded in 2012 that “consuming foods containing ingredients derived from GM crops is no riskier than consuming the same foods containing ingredients from crop plants modified by conventional plant improvement techniques.”  In a massive study assessing the potential unintended health effects of genetically engineered food, the U.S. National Academy of Sciences found that, “To date, no adverse health effects attributed to genetic engineering have been documented in the human population.”  Several other large and highly respected science and health organizations from other countries have made similar statements based on the wealth of evidence that has been amassed. Seifert’s denial of the existence of long-term studies is also wrong. In addition to animal feed studies, there are numerous long-term studies of the health effects of GM foods that are freely available to the public. These studies range from 10-20 years in length, most of which are conducted at a cost in excess of tens of millions per year. The European Union, for example, has conducted 15 year-long studies and has spent more than €300 million on research projects looking into the biosafety of GMOs. In a 2010 overview assessment of EU research on GMOs, the European Commission stated, “The main conclusion to be drawn from the efforts of more than 130 research projects, covering a period of more than 25 years of research, and involving more than 500 independent research groups, is that biotechnology, and in particular GMOs, are not per se more risky than e.g. conventional plant breeding technologies.”  In the U.S. alone, it takes between 12 and 15 years to go through the regulatory process required by the United States Department of Agriculture (USDA) and the Environmental Protection Agency (EPA) to move genetically modified foods from the initial R&D stage to the shelves of your local grocery store. If Seifert has done any of the research he says he’s done, he should know all this. If he had gone the intellectually honest route and avoided going into his research with a preconceived conclusion, he might have ended up titling his film GMO OK. But Seifert clearly did not go about his project in an intellectually honest way. Seifert is the one trying to hide facts that contradict his narrative, not the biotech industry. JoAnna Wendel and Jon Entine, “With 2000+ Global Studies Affirming Safety, GM Foods among Most Analyzed Subjects in Science,” Genetic Literacy Project, October 8, 2013, https://www.geneticliteracyproject.org/2013/10/08/with-2000-global-studies-confirming-safety-gm-foods-among-most-analyzed-subject-in-science/ (accessed April 3, 2016). American Association for the Advancement of Science, “Statement by the AAAS Board of Directors on Labeling of Genetically Modified Foods” (20 October 2012), http://www.aaas.org/sites/default/files/AAAS_GM_statement.pdf (accessed April 3, 2016). The National Academy of Sciences, Safety of Genetically Engineered Foods: Approaches to Assessing Unintended Health Effects (Washington, D.C.: The National Academies Press, 2004), p. 8. PDF available at http://nap.edu/10977 (accessed April 3, 2016). Rod A. Herman and William D. Price, “Unintended Compositional Changes in Genetically Modified (GM) Crops: 20 Years of Research,” Journal of Agricultural and Food Chemistry 61 (February 2013): 11695-11701. http://pubs.acs.org/doi/full/10.1021/jf400135r (accessed April 3, 2016). Marc Brazeau, “About Those Industry Funded GMO Studies…,” Biology Fortified, February 28, 2014, http://www.biofortified.org/2014/02/industry-funded-gmo-studies/ (accessed April 3, 2016). EFSA GMO Panel Working Group on Animal Feeding Trials, “Safety and Nutritional Assessment of GM Plants and Derived Food and Feed: The Role of Animal Feeding Trials,” Food and Chemical Toxicology 46 (March 2008): S2-S70. European Commission, Directorate-General for Research and Innovation, A Decade of EU-Funded GMO Research (2001-2010) (Luxembourg: Publications Office of the European Union, 2010), p. 16. Available online at https://ec.europa.eu/research/biosociety/pdf/a_decade_of_eu-funded_gmo_research.pdf (accessed April 3, 2016).